While managing multiple domains with huge number of managed servers becomes very hard if you don’t have the scripts to manage the server life cycle. Sometimes we need just one server to restart instead of restarting the whole domain post patching a jar or artifact and sometimes you need all the managed servers to be restarted, etc. Same, I had a issue that I needed to check the status of the managed servers in realtime while they were getting started, so I looked through Google and found some scripts in wlst but all of them were not fulfilling my purpose of realtime monitoring of the status of servers while they get started/stopped. I also wanted colored output and progress bar also, so that i can see that which server came up online. I had also requirement of a rolling restart of the servers, so needed to check one server after one server. 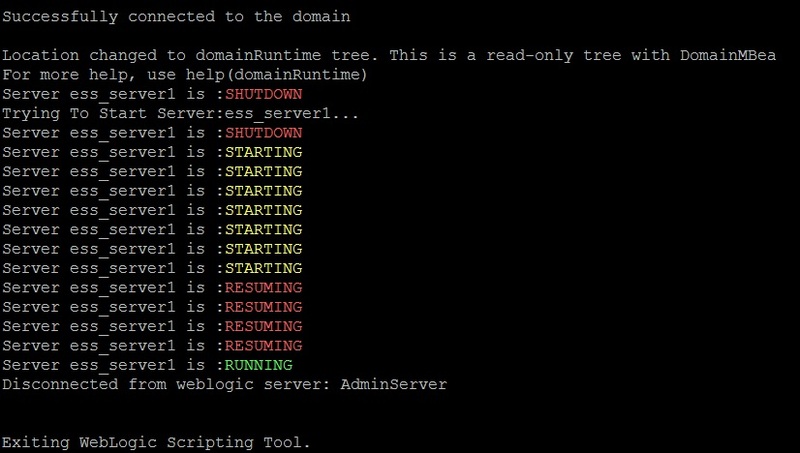 So for this I wrote below wlst script example to do start, stop, monitor, status check etc of weblogic server. #Python Script to manage Servers in weblogic server. #It can be used to check status,stop,start of applications in weblogic server using weblogic wlst tool. print "java weblogic.WLST manageServers.py -u username -p password -a adminUrl [:] -n ServerName -c [stop:start:restart:status:stopall:startall:statusall]\n"
print "Missing \"-n ServerName\" parameter.\n"
print "Missing \"-c command\" parameter.\n"
create a bash script named manageServers.sh in the same directory where you have saved the wlst python script manageServers.py with below content. You can run the scripts in any manner, directly via wlst or using the bash wrapper script with prefed username and passwords. Successfully connected to Admin Server ‘AdminServer’ that belongs to domain ‘MyDomain’. Location changed to domainRuntime tree. This is a read-only tree with DomainMBean. Output will be similar to above output. If you find this article useful please share!! I have problem to execute Command raw_input or sys.stdin.readline(), which I try use in pythonscript.py file. When I use raw_input I get error EOFError: raw_input(), when I use sys.stdin.readline() it’s nothing happened. It’s looks that, because I start pythonscript.py from bash script examplebash.sh the standard input doesn’t work? Instead of passing the server name as command line parameter, I am looking at displaying all servers of the domain as a list and then type in the number to pickup the server for startup/shutdown. I will appreciate if you can direct me to anything similar. You can do something like list the servers/applications and add them to variables and read the input to execute the command on them. Just wanted to know if their is any performance issue while running this script. It’s using the Oracle recommended inbuilt WLST for these life-cycle operations, so it should not have any performance issues while running them. You can go ahead and use it without worries. Does this script include bouncing of coherence server? Hi Ramakanta. This is a very useful script. Thank you. We have the following requirement. We have multiple domains in a environment for different weblogic products like portal sever domain,. soa domain, osb domain etc. Every domain has its managed servers. How do we start all the servers from all the domains with a single WLST script? Please advise. Thanks again. We have multiple domains on separate vm’s. Please advise how we can ssh or connect to the other domains on separate vm’s and perform a restart for all these domains at once using WLST. Please let me know if there is a way we can perform the above task. Nevermind. I was able to figure it out. We established a route and was able to connect to other servers on separate vm’s using the same commands inside the script with different host name and ports. actually the managed server has been stopped successfully but i couldnt start it again by the script, beside please i need to stop/start all the managed servers my domain all at the same time by the script. Can you please post the error you are seeing while starting. i want to use encrypted username and password of weblogic. Could you please help. You can modify the script to use encrypted passwords from file. the managed server has been stopped successfully but i couldn’t start it again by the script. below is the command i am using and the output for the same. Successfully connected to Admin Server ‘AdminServer’ that belongs to domain ”. See if manually via console you are able to start or not and see incase the script is getting the status from the admin server or not? The script is able to get the status from the admin server. I think the method used in the script requires node manager to start the managed server. is there any way i can start server without node manager? 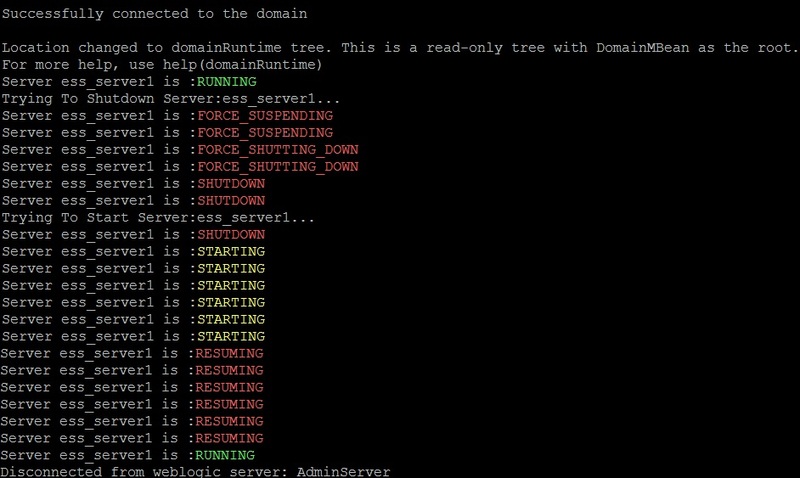 Using the WLST startServer command, the administration server can be started without using a NodeManager. The server runs in a separate process from WLST, which means that exiting WLST does not shutdown the server. The script is very well written. Thanks a lot for sharing the scripts. Note: I want to start manage server with node manager. The manage server is working for stopping the server, but the script is not starting the manage server. Below are the script log. I tried directly traversing into the wlst directory and starting the manage server but from there also stopping works but starting the server command is not working. Any idea how can I resolve this issue. Successfully connected to Admin Server ‘AdminServer’ that belongs to domain ‘ecmdev_domain’. Note: I want to start manage server WITHOUT node manager. i am new to this wlst script. my requirement is to monitor weblogic server status say admin server,oacore_server1 and oaea_server1. if any of the server status gone to shutdown or unknown, we needs to get the alert. could you please provide me the script to do this. I would like to run script with startall command and load specific file per managed server. What you can do is create a small shell script and put it in each env. which will be running the setwlenv of that env. before running the command to start or stop. Great Script. But i have a difficulty to get an information for Adminserver. Its working fine for managed servers. This is the error i am getting while i am trying to pull a status of admin server. Successfully connected to Admin Server ‘AdminServer’ that belongs to domain ‘domain’. Can you elaborate what your code change is, which is showing error? Default article code is for managed servers only. I fixed that issue. How can i add my Adminserver in the list. I want to start/stop/restart my Adminserver with managed servers. I want to do stoping and starting the Admin server in one script, once i execute the script , it will first stop the admin server if running, then delete the logs and start the server. above script is only for MS. I have the same issue faced by other folks. everything is working properly except startup of managed servers. Is it mandatory to start node manager before starting admin and other managed servers? superb script.Great job..:-) .it was very helpful… thank you sir. but it would be pleasure if you help me to solve this issue,,, i’m new to wlst,, i’m a java developer…actually my weblogic server is in another system and i’m running this script in mine using putty, my doubt is without logging into admin server in that system where weblogic server is installed,,, can i start it here using putty ????????? cause when i tried running this script before to check the status of server,, it showed me no stack trace under domain tree and exiting the wlst. and when admin logged into admin server using his credentials ,,then it showed me the status of server. why is it so??? can’t i run this script and get the status of the server ,,even when admin server was not logged in ,,status as its in shutdown state, why? The status of a managed server is stored in AdminServer via heartbeat .. On request Admin Server responds back on what is the current status of managed server. i have an another doubt. I am testing your script and i get the below error. The java version seems to be ok, I am currently running Weblogic 10.3. Not sure what you are doing wrong here. UnsupportedClassVersionError means that the Java runtime environment you are using doesn’t recognise the version of a class file that you are trying to execute. The most common cause for this error is trying to use a class file compiled for a newer Java version on an older Java version – for example, you are trying to use a class compiled for Java 6 on a Java 5 runtime environment. Can you post the content of WrapperScript.sh file? I can invoke the script in my Development environment. In UAT, I am getting authentication issue. Could you please help me? Can you post the errors you are seeing in logs? Ramakanta – Super awesome script!!!! Thanks so much!!! – I hope you can still answer my question. My current production requirement requires me to always first shutdown the managed servers then the admin server last. Say we have MS1, MS2, MS3 & MS4 – How can I pass multiple servers to the flag -n so I can shutdown all managed servers first as required? Hi thanks again! – How can I execute this script without having to show my credentials? specially I’m interested in hiding the password used to manage. Thanks! File “/home/FMW/oracle_common/modules/internal/clients/oracle.fmwshare.pyjar.jar/wlstScriptDir/lib/ora_help.py”, line 12, in ? File “/home/FMW/wlserver/modules/com.oracle.weblogic.management.scripting.jar/weblogic/management/scripting/core/utils/modules/wlstModule_core.py”, line 20, in ? File “/home/FMW/oracle_common/modules/internal/clients/oracle.fmwshare.pyjar.jar/wlstScriptDir/lib/ora_util.py”, line 15, in ?